Home / Contests • Featured / Contest Time! Win Ice: Season One Starring Cam Gigandet! Jeremy Sisto! and Donald Sutherland! The Series Is Out Now On DVD! Contest Time! Win Ice: Season One Starring Cam Gigandet! Jeremy Sisto! and Donald Sutherland! The Series Is Out Now On DVD! Alright STOP… Collaborate, and listen… It’s Ice Ice Baby! 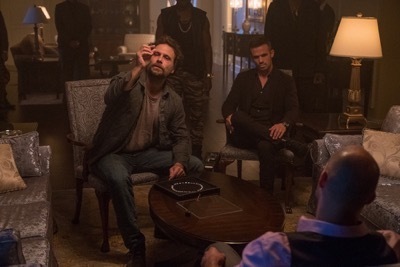 Okay, while it may not be an adaptation of the popular song, the TV series Ice stars Cam Gigandet (Burlesque), Jeremy Sisto (Clueless) and Donald Sutherland (Buffy The Vampire Slayer) in a gritty new crime series. I’ll have a review posted soon, but our friends at Entertainment One wanted to give you an opportunity to win a copy for yourself! Because, that’s just awesome right! This May, Entertainment One (eOne) invites home audiences to buckle up for the “sharp and stylized” (Deadline) high-impact crime series, ICE. An AT&T Audience Network/DIRECTV Original, ICE, executive produced by Antoine Fuqua (The Magnificent Seven), delves into the dark, gritty and dangerous underbelly of the diamond trade with an all-star cast featuring Cam Gigandet (Twilight, Easy A, “The O.C.”), Jeremy Sisto (“Suburgatory,” “Law & Order”), Ray Winstone (The Departed, The Sweeney) and Donald Sutherland (The Hunger Games series, Forsaken). On May 16, eOne delivers the shiny goods with ICE: SEASON ONE, a 3-disc DVD set featuring all 10 original broadcast episodes and bonus content, priced at $40.99srp. 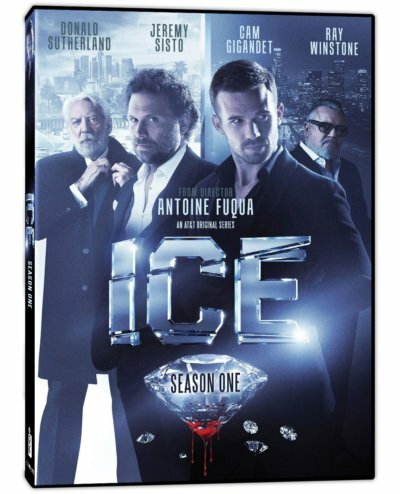 ICEfollows the prestigious diamond-dealing Green Family, as they plunge into the high-stakes underbelly of the Los Angeles diamond trade. Jake (Cam Gigandet, The Magnificent Seven, The Twilight Saga franchise) and Freddy (Jeremy Sisto, Six Feet Under, Law and Order, Suburgatory) are brothers brought together by their father, Isaac (Raymond Barry, Training Day, Born on the Fourth of July), the patriarch behind Green & Green Diamond Company, and their uncle Cam (Ray Winstone, The Departed). After wildcard Freddy kills a prominent diamond dealer, his brother Jake must bail him out and save the family business from Lady Rah, a ruthless diamond dealer who is not afraid to get her hands dirty (Judith Shekoni, Heroes Reborn, The Twilight Saga franchise). In saving Freddy, the family falls under the thumb of Lady Rah, who begins to involve the Greens in her business deals. As she steps up her demands, the Greens must maneuver amongst blood diamond deals and double-crossing criminals, while attempting to stay one step ahead and keep the doors to the business open. But when Pieter Van de Bruin (Donald Sutherland, The Hunger Games franchise), a ruthless diamond smuggler with designs on Green & Green Diamond Company, arrives in Los Angeles, the family realizes their problems have only just begun. Extras on the set include a “Premise” featurette, interviews with Sisto and Gigandet and a “Diamond Girl” music video from Rachele Royale. From global independent studio eOne and Antoine Fuqua’s Fuqua Films, the original series is executive produced by Robert Munic (“Fighting,” “The Cleaner”) and Emmy Award winning writer, James Manos, Jr. (The Sopranos, The Shield, Dexter); Fuqua directed the first episode. eOne produces the show in association with AT&T and also controls international rights to the series. Also check out Ice: Season One on Amazon! Contest Time! Win A Hand Signed Autographed (Slightly Damaged) Chris Pine Magazine! Beam Me Up! MTF Contest Time! Win Pacific Rim On Blu-Ray! Guillermo del Toro & Charlie Hunnam Goodness! I like that Donald Sutherland is still around and acting. I like Donald Sutherland. i think that he is a great actor. I think that Donald Sutherland is a cool actor. Donald Sutherland has always been great since M.A.S.H. I like Donald Sutherland. I remember the M.A.S.H. project.